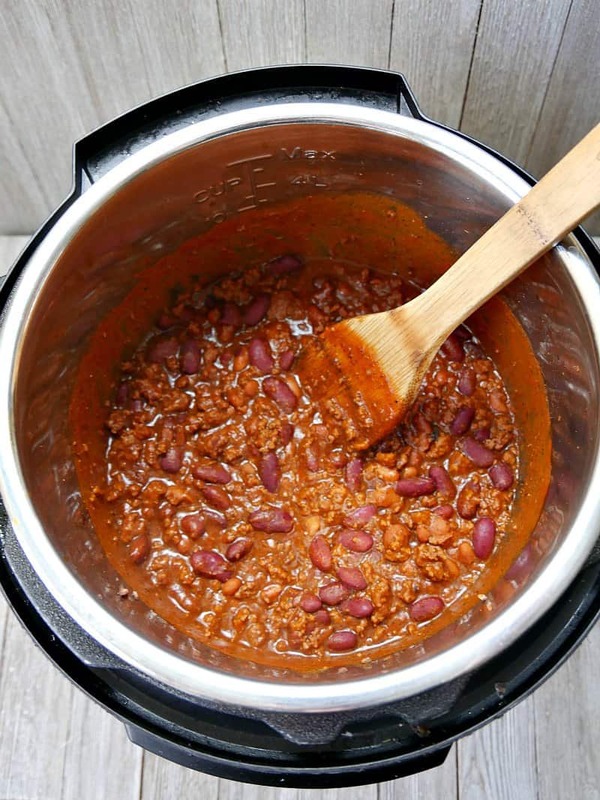 Make chili in the pressure cooker in about 30 minutes with this easy pressure cooker chili recipe using canned beans, tomato sauce and ground beef. This post is sponsored by Bush's Beans. 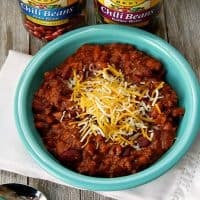 I have been working on perfecting a chili recipe for about the past two years. I tried all kinds of variations and recipes before I finally settled on what I love in a chili. 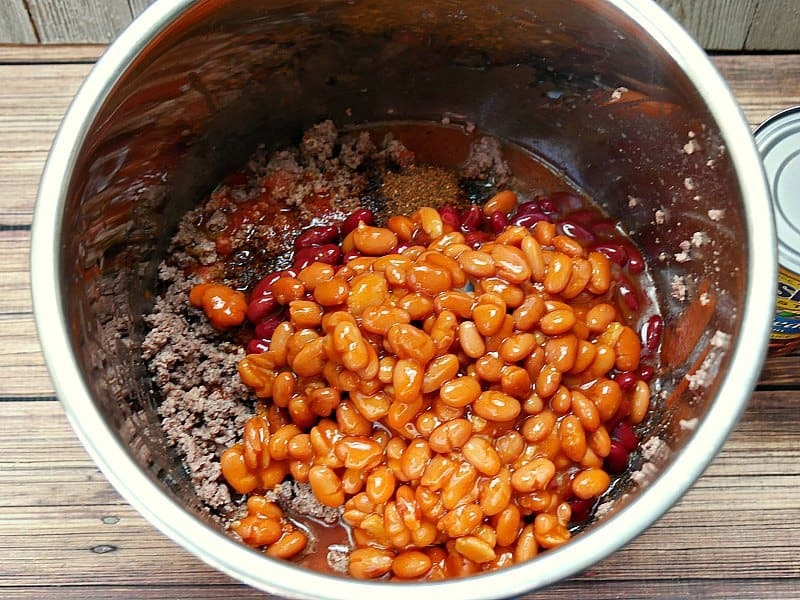 I like it to be a thick chili with lots of meat and beans so it has substance. No soupy, brothy chili here! I also don't love it full of vegetables. This isn't vegetable soup with a little bit of meat, beans and chili powder thrown in. This is hearty, thick, stick to your ribs, CHILI. I found that the trick to getting nice thick chili is to skip any broth or tomatoes and head straight to tomato sauce and chili beans. In addition to the chili being hearty, I also needed it to be quick and easy. I didn't want to have to cook up beans and then let this simmer all day long. This chili can be made last minute, on the fly, as long as you keep everything you need to make it, which isn't much, on hand in the pantry and freezer. If your electric pressure cooker has a saute function, use that to brown the ground meat. Otherwise, brown the meat on the stove top. Drain the meat and put it in the pressure cooker. The trick to getting a nice thick chili is to use nice thick liquids. Skip the broth and diced tomatoes and use tomato sauce instead. I always put beans in my chili because it helps stretch the meat and adds a nice texture and flavor. I like my chili to be easy and quick to make so I always use two different canned beans – pinto and kidney. But on a recent trip to Walmart to restock my chili supplies, I decided to try out Bush's Best chili beans instead. 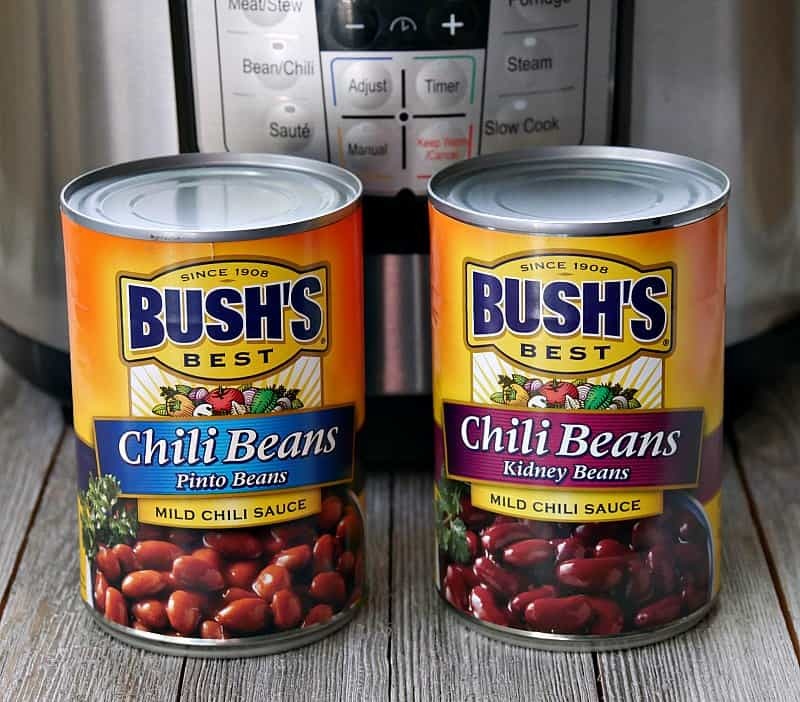 Bush's offers a bunch of different beans in the chili style. In addition to the pinto and kidney beans, they also offer black beans and white beans in chili sauce. They also offer both a mild chili bean and a spicy chili bean so you can choose either one. I went with mild because no one in my house except me likes heat in their chili. Mix it up and have fun! The beans come in a chili sauce. 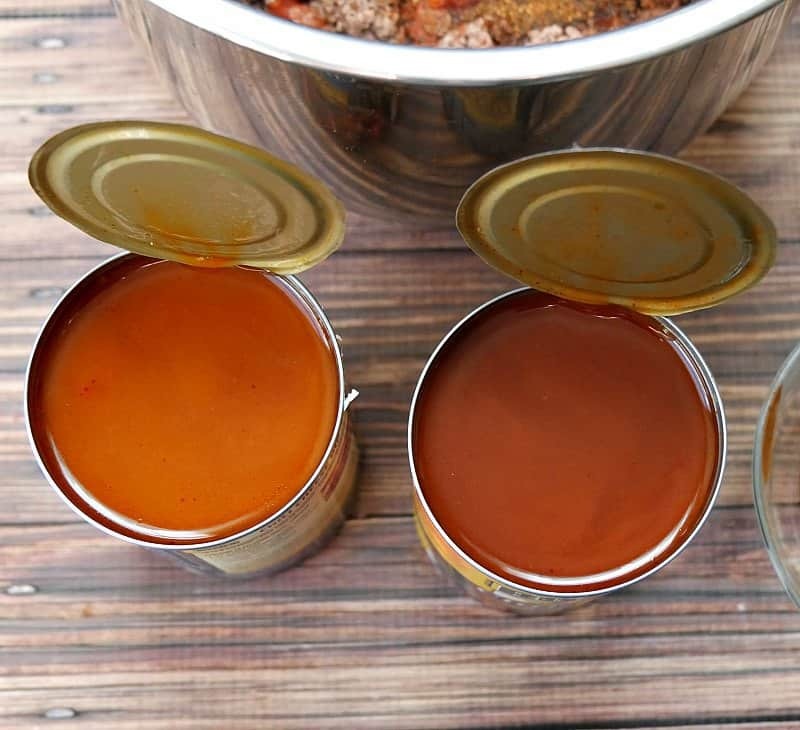 Because we already have tomato sauce, and we want the chili thick, drain the sauce off the top of the cans in to a bowl and set it aside. 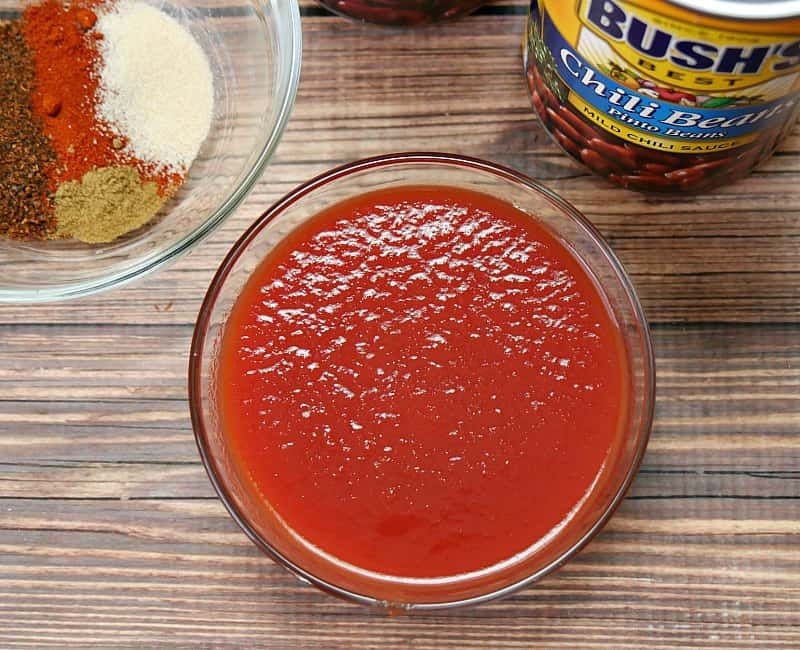 You can use the chili sauce to add flavor or thin the chili out when it's finished cooking. I ended up not using the extra sauce. 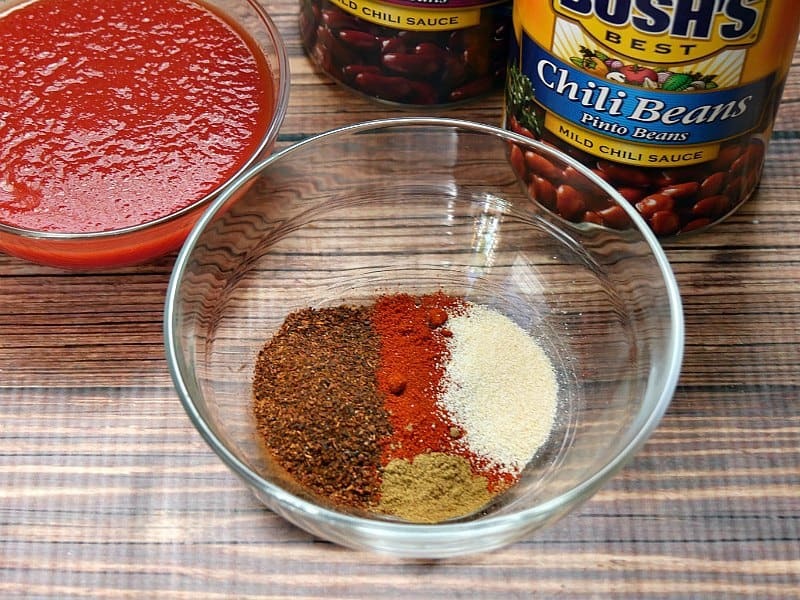 The chili beans and sauce are packed with flavor, but you'll still want to add at least chili powder. I also add garlic powder, paprika, and a touch of cumin. I'm not a big fan of cumin, but it needs at least a pinch. Add the tomato sauce, spices, and beans to the pressure cooker with the beef. Mix it all together. Put the lid on and seal it up. Set the pressure cooker on manual for 10 minutes. 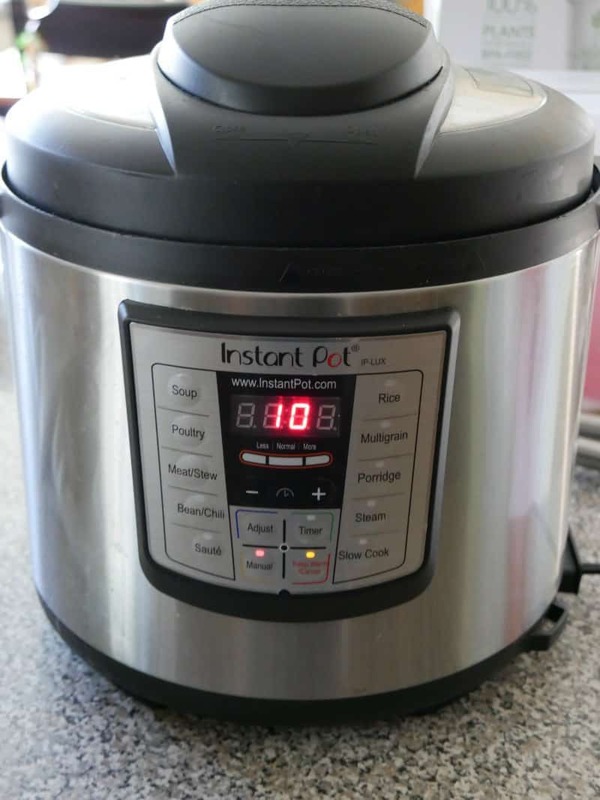 When it's done cooking, turn the pressure cooker off and allow it to natural release for 10 minutes. Release the rest of the steam with a quick release. The chili is done at this point. Taste it for seasoning preferences and add more of what you like. I wanted the chili thicker so I turned on the saute function of the pot and allowed the liquid to boil off. Just be careful because the saute function is pretty hot and it will burn the chili to the bottom of the easily. Stir constantly or turn the saute function off once the chili is boiling. Once the chili is how you like it, serve with your favorite sides like shredded cheese, crackers, sour cream, and chopped onions. Or you can let it cool and refrigerate or freeze for later. This is also a great chili to use on baked potatoes! Turn pressure cooker on saute and allow to heat up. 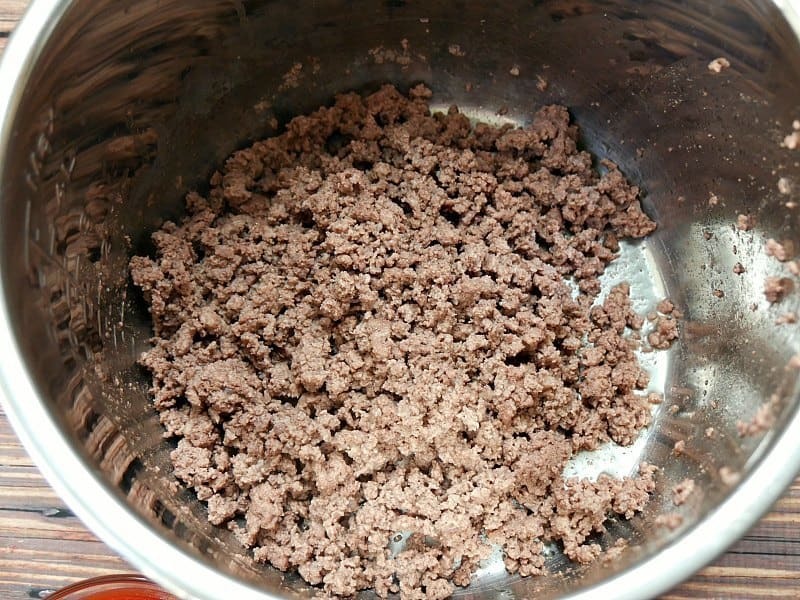 Brown the ground meat in the pressure cooker until cooked through. Season with salt and pepper. Drain the ground beef and then place back in the pot. Turn the pressure cooker off. Add the tomato sauce and half the spices to the ground beef in the pressure cooker. Drain off the very top liquid from the cans of beans in to a bowl and set aside for later. Empty the beans into the pressure cooker. Stir everything together and place the lid on the pressure cooker. Set the pressure to cook on manual for 10 minutes. Use a natural release for 10 minutes and then do a quick release for any remaining steam. Remove the lid from the pressure cooker and check the taste and consistency of the chili. If you want it thicker, turn the saute function on and allow the chili to thicken. Add the reserved bean sauce as needed to add flavor or to thin the chili. Add reserved spices as well as needed. Add cayenne for more heat as desired. The chili can be served immediately or allowed to cool and re-heat or freeze for later. I haven’t done it but yes, I think you can. Just cook on high for a few hours. Absolutely. I’d cook on high for 2 hours or low for 3-4. My first meal using a pressure cooker and wow. The wife and I loved it. Looks yummy! Thanks for sharing with SYC. This will be a delicious Pot of Chili! Thanks so much for sharing your post with us at Full Plate Thursday. Have a great week and come back soon! I’ve been thinking about chili! Thanks for sharing at the What’s for Dinner Party. I have an instant and I think I need to get it out and make this. This looks yummy! Aren’t they awesome?? It’s totally changed dinner time around here. It’s so easy now. 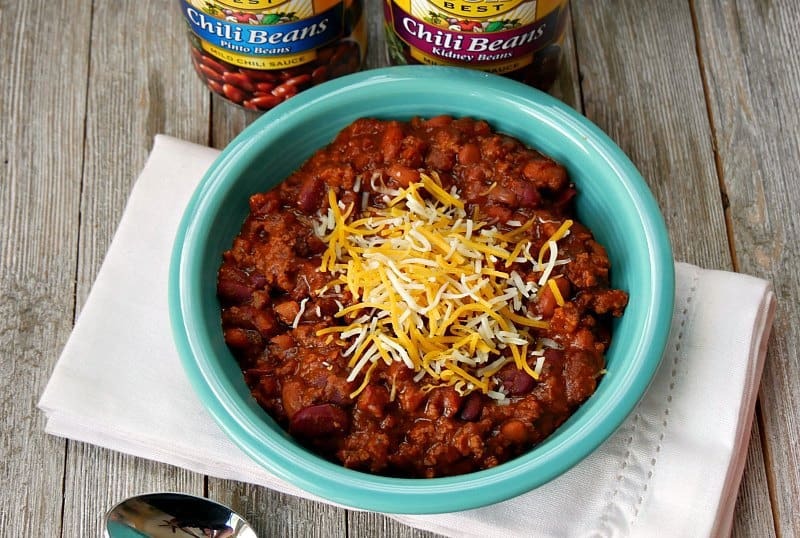 Chili season is here and this looks like a great recipe! Thanks so much for sharing your awesome post with us at Full Plate Thursday and come back soon! 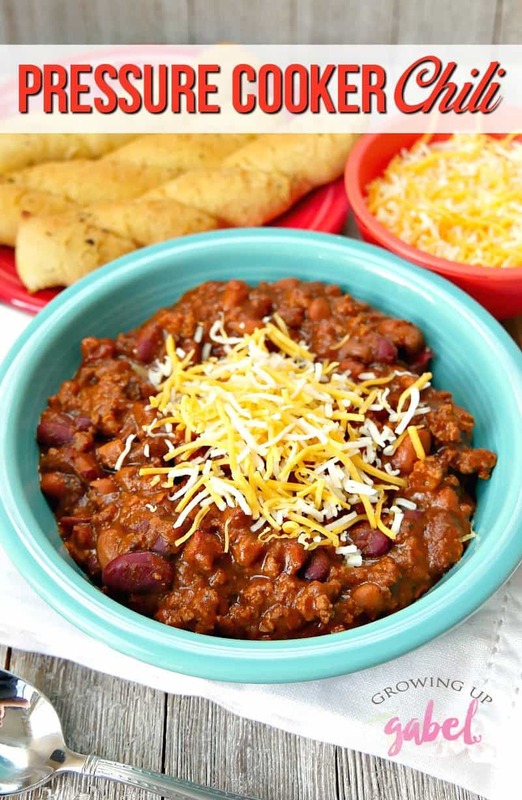 I love a good chili recipe, and yours doesn’t disappoint. 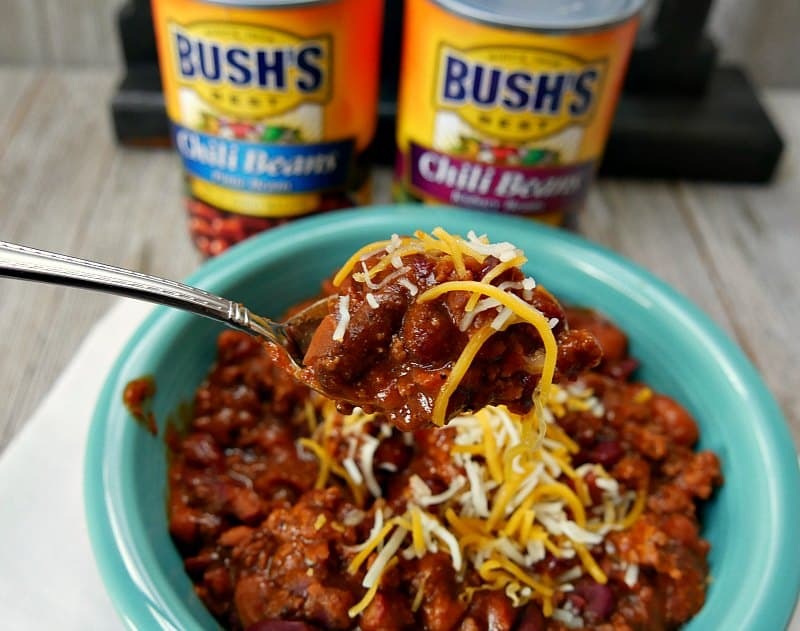 Thanks for bringing your hearty and yummy chili to the party this week! Happy Fiesta Friday! I also love the pursuit of the perfect chili recipe. Yours is closer than mine, so I am anxious to make this for my family.